9 Bedrooms. 4 Baths. Sleeps 18-24. PLEASE CONTACT THE OWNER BEFORE YOU BOOK THIS PROPERTY. The entrance to this newer 3,000 square foot home is in a private wooded setting. Out the back door, it is a short walk across the lawn to the sandy beach and the water. Two decks, a screened porch, a large hot tub and ample windows allow one to enjoy the spectacular views. Dock or launch your boat at the small marina next door. This well appointed home comfortably accommodates 18-24 guests and is perfect for family reunions & large groups. The Master Bedroom suite includes a private bath with whirlpool tub. The private family suite has 2 Bedrooms & 1 Bath. There are nine bedrooms total and four tile baths. Each of the bedrooms has its own unique character and has a cozy corner for reading or contemplation. The large Greatroom, Gameroom and Screened porch provide indoor common areas for your guests. Wireless Internet. Enjoy the fully equipped gourmet kitchen. Our home works well for family reunions or other groups wanting to vacation together. We are unable to accommodate groups who wish to use our home for weddings or parties including bachelor/bachelorette or after prom parties. Amenities: Bed linens, bath towels & kitchen towels are provided at no extra charge. Enjoy the fully equipped Gourmet Kitchen with a Dishwasher, Microwave, Blender, Toaster, Coffee Makers,, Electric Griddle, Ice Maker, Mixer, Cuisinart, Crock Pot & Sharp Knives. Other amenities include: a large Hot Tub with a view of the bay (not available in winter), a Gas Fireplace, Washer/dryer, Central Air Conditioning, Ceiling Fans in every room, a large Library, Gas Grill, Fire Pit, Wireless Internet, Phones, Satellite TV, VCR, DVD & CD Player with Surround Sound in the Greatroom, two additional TV's with VCR's. Dock your boat in our slip at the small marina next door. 5 Kayaks, several pairs of Snowshoes, and much, much more........... Please visit our website for more detail and pictures. Activities: Fishing, golf courses, downhill skiing, cross country skiing, snowmobiling, biking (Rails to Trails). Sleeping Bear Dunes National Lakeshore, Leelenau State Parks, Lake Michigan beaches, wine tasting at one of the area’s world renowned vineyards, Traverse City, Suttons Bay, Northport, Leland, Glen Arbor, Interlochen (Arts Festival), Leelanau Sands Casino. Please visit our website for more detail and pictures. •	There will be a charge of $100.00 for all reservations canceled. •	All cancellations are subject to forfeiture of the entire deposit amount unless the property is re-rented at the full rental rate; a refund will then be made less the cancellation charge of $100. •	Once the final payment is made thirty days prior to arrival, the total rental rate for the week will be forfeited unless the property is re-rented at the full rental rate; a refund will then be made less the cancellation charge of $100. If the damage deposit has been paid prior to cancellation, it will be refunded. •	If you have concerns about unforeseen events that might require cancellation, please obtain vacation insurance. My family lives in Ann Arbor Michigan. We have three children, the youngest of whom is 27. We began renting vacation homes in Northern Michigan in the 1980's. It was always a 'shot in the dark' renting homes sight unseen. When we discovered our property in the early 1990's we knew we had found somewhere we could return to every summer. Our three children could swim in the bay which is shallow for quite a ways. We loved tubing and snorkeling in the crystal clear water. There were plenty of 'critters' for the kids to study and catch. 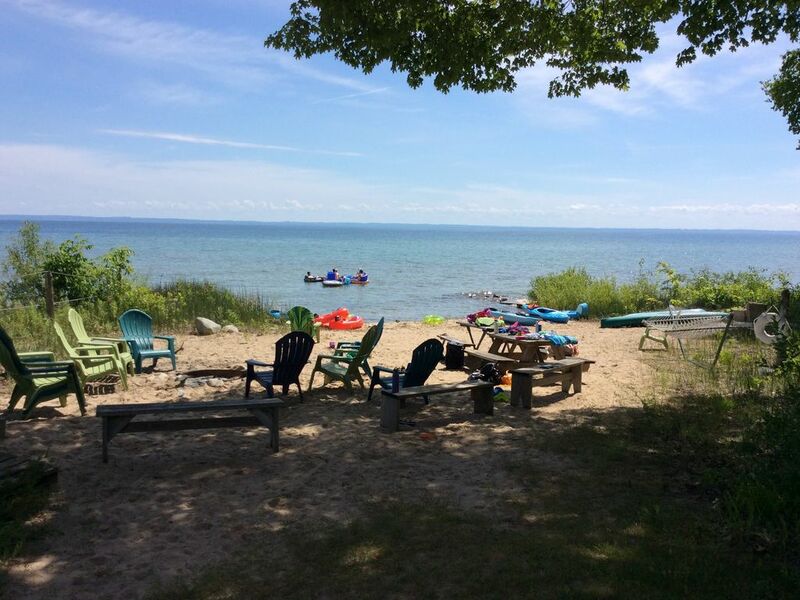 The Leelanau peninsula is absolutely beautiful and there are many activities close by. In 1999, when the owner of the property who lives next door offered to sell it to us, we couldn't refuse. We purchased the property in 1999, removed the old cottage and built the new house in 2000. We enjoy getting together with our extended families for reunions so we built Roby's Retreat with family reunions in mind. We also provide laundry detergent, soap and paper products to get you started. We provide beach towels as well as bath linens. We provide dishwasher detergent as well as dish soap. Beautiful location! The owner was great to work with. The home is comfort, very nicely furnished, clean, and well maintained. Would definitely rent it again. The property was very nice. Beautiful setting right on Grand Traverse Bay. We had a great experience staying at this property. The layout of the house was well thought out, and accommodated our group of 17 very well. It was very clean when we arrived and had everything we needed. The setting on Grand Traverse Bay was beautiful. I would definitely stay there again and recommend it to any of my friends! The perfect place for a group get-away! We were 12 women who came from Houston for a week’s getaway. The house had a great, open floor plan with a well-stocked kitchen. The living area was very comfortable and seated most of us. The remainder were right there at either of the two tables. Some of us kayaked with everything easily accessible, some played games at the two dining room tables, some went to the casino that was just four miles away. Each day we would take a day trip including Leland, Sleeping Bear Dunes, Traverse City, beautiful wineries, Old Mission Lighthouse, Mackinac Island, etc. We will be back! We were happy with all the bedrooms. The couch’s were nice and comfortable, and great table to seat everyone. We did not use beach or fire pit so can’t speak about that. Leelanau Peninsula is a beautiful fun vacation spot, and we thoroughly enjoyed our gal’s get away. We had such a nice time here. It was very clean and well put together. There were plenty of supplies if you forgot/needed anything, which was a very awesome perk. There were 22 people in our group and it never felt crowded. The kitchen can be a little tight but we just tried to avoid it unless cooking and cleaning. The only issue we had were the little bugs every.where. I think it was mayfly season and there were literally hundreds of thousands outside. However, since they weren’t mosquitoes it wasn’t too much of a problem for us, just something to be aware of this time of year. Overall we had a great time, would stay here again in a heartbeat!